I’ve been at the lake for much of the summer — and it’s a good summer to be there. Temperatures in Ontario have been averaging around 30 degrees centigrade. 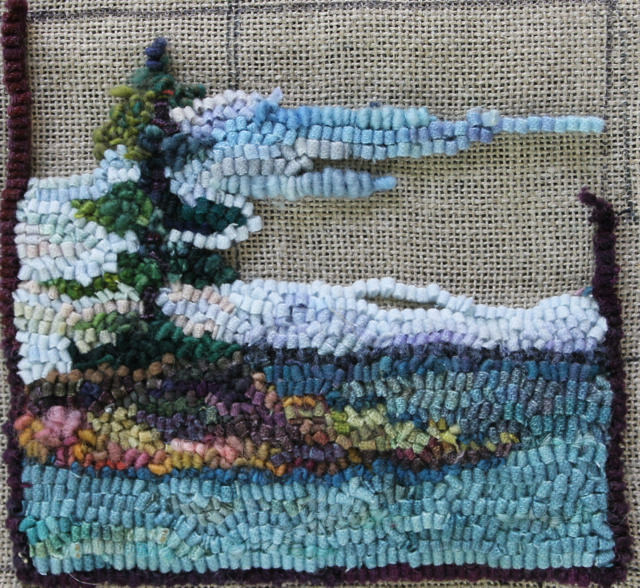 While I enjoy exploring the area around the lake, including local villages and provincial parks, I spend most of my time on or near the island reading, rug hooking and sketching. I love the landscape of our lake and explore it by kayak and canoe. It is especially beautiful in the late, late afternoon. I’ve been doing some of my favourite scenes in my sketchbook and with my rug hook. Big thanks to Jen Manuell of Fish Eye Sisters who, in spite of all the incredible work of setting up her booth at the Haliburton show, remembered to bring me some slubby yarn for my landscape hooking. The Haliburton Art and Craft show is a wonderful chance to see high quality Canadian work–and congrats to Jen who won best fibre artist in the show! 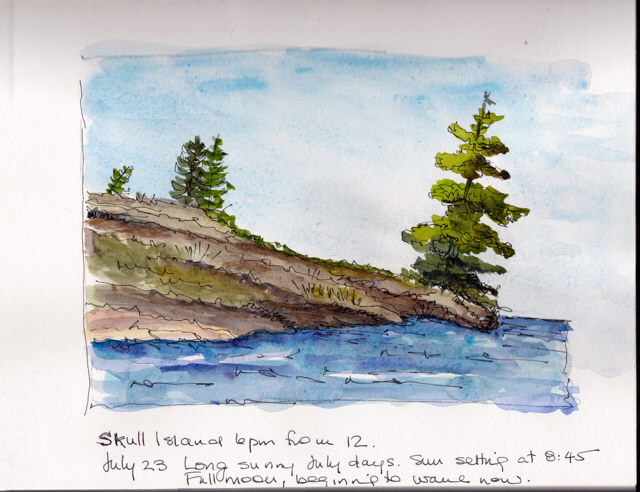 Below Skull Island tree almost hooked and in the sketchbook. 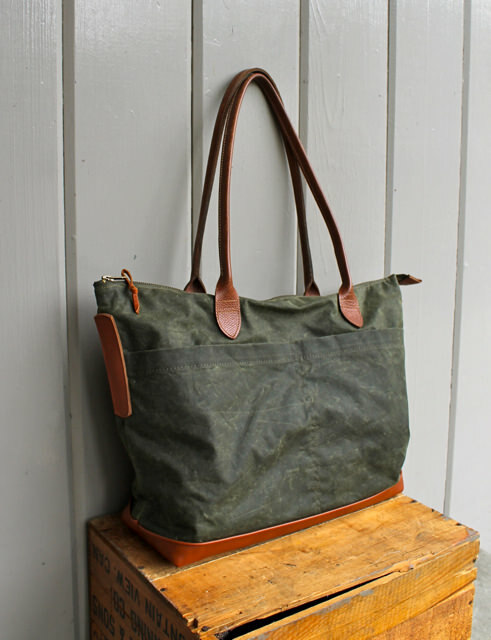 This rugged tote is a one-of-a-kind. It combines my favourite fabric and leather. The handles are vintage, from a time when quality was high. They are still beautiful leather and combine well with the caramel leather on the bottom and sides of this tote. 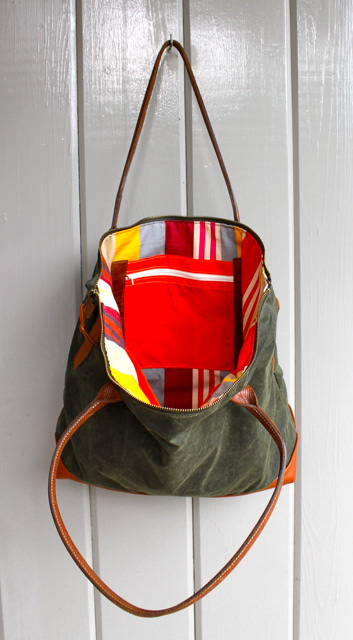 The tote is designed for daily use or for travel with lots of compartments inside and out. It has two large exterior pockets where travel documents, phone etc can be slipped for convenience. 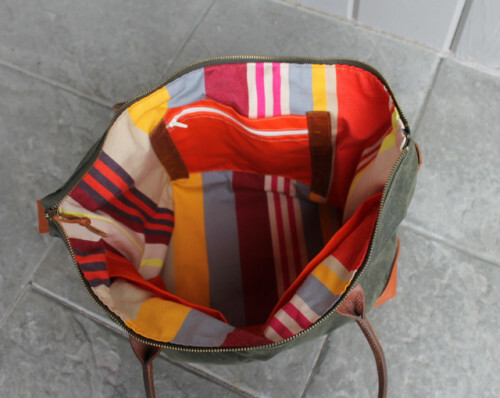 Inside it is bright striped canvas from Ireland and there are four pockets, made of orange waxed canvas. one of them zippered. The side has leather tabs for extra strength. 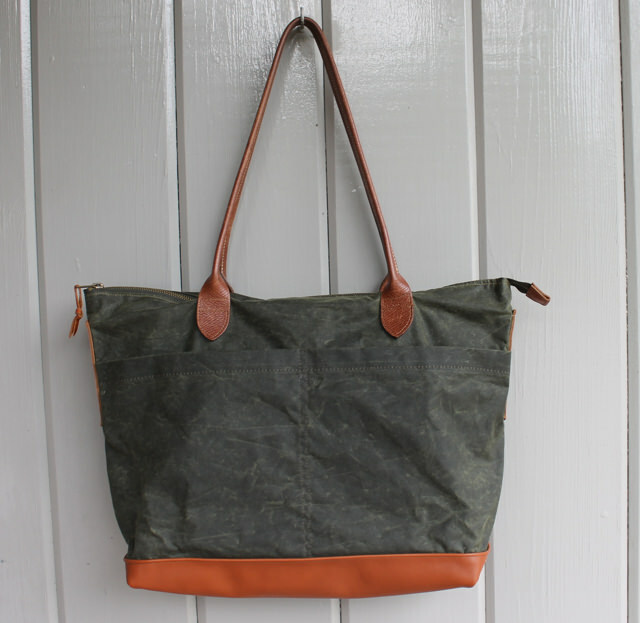 The waxed canvas is manufactured in the USA, can be wiped clean and has a great vintage look. In the on-line store today.